Will Royal Caribbean's Next New Ship Be Called Spectrum of the Seas? Update. July 3, 8:50 a.m. EDT: Royal Caribbean has re-trademarked two of the "of the Seas" names it let lapse in 2014: Apex of the Seas and Joy of the Seas. (10 a.m. EDT) -- Royal Caribbean has trademarked the named Spectrum of the Seas, opening the possibility that a future ship in the line's fleet could bear this name. The line filed for the trademark on June 21. 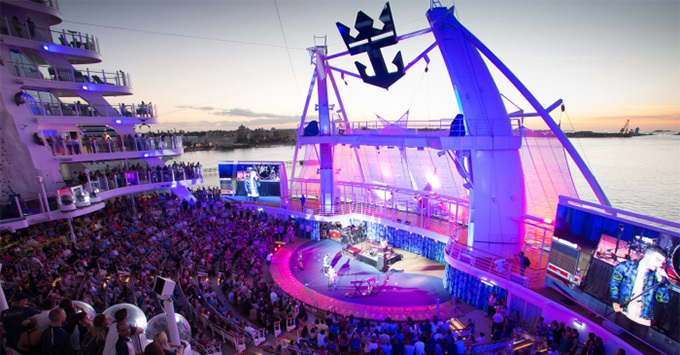 In January, Royal Caribbean trademarked four other "of the Seas" names including Symphony of the Seas, which was announced as the name for the line's next Oasis-class ship in March. Other names trademarked at the same time were Valhalla of the Seas, Sunrise of the Seas and Icon of the Seas. All are still active trademarks for Royal Caribbean.